Study after study has tackled the question of how young children learn—and for decades Vivian Gussin Paley has argued that if we want the best answers to that question, we simply need to listen to children. In her nearly fifty years as a teacher and writer, Paley has done just that, listening closely as kids, at play and at school, tell stories, invent characters, and imagine situations to help them understand the complicated and surprising world around them. With The Boy on the Beach, Paley continues her listening, using the stories of young children—recounted in their own words—to help understand how they use play and stories to build community in the classroom, on the playground, and at home. She then follows a kindergarten class through one school year, letting us watch as the children get to know one another and their teacher, and incisively analyzing the role their increasingly shared imaginative lives play in their education and development. 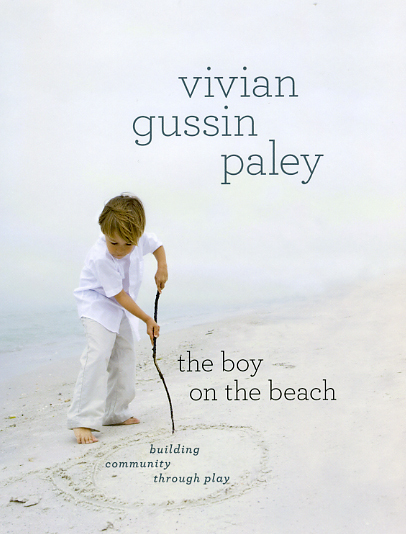 Never less than charming, yet rich with ideas and insight, The Boy on the Beach is vintage Vivian Paley, sure to be embraced by teachers and parents alike. Also read an excerpt from the book.